The stretch of the N4 where the crash occurred. 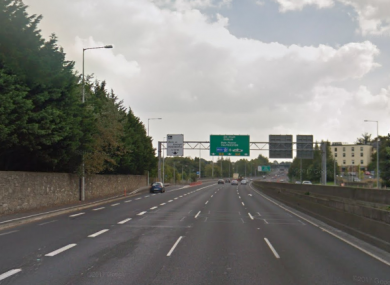 GARDAÍ ARE APPEALING for witnesses following a fatal road crash on the N4 at Lucan. The collision occurred shortly before 1pm on the citybound approach to junction 4a when a car veered from the carriageway and struck a stone wall. The driver of the car, a 32-year-old man, was seriously injured and pronounced dead at the scene a short time later. The scene was attended by emergency services personnel and the man’s body was later removed by ambulance to the mortuary at Connolly Hospital. The coroner has been notified and a post-mortem examination will be carried out. Garda forensic collision investigators have concluded an examination of the crash site and the road has since reopened to traffic. Anyone with information is asked to contact Lucan Garda Station 01-666 7300 or the Garda Confidential Line 1800 666 111. Email “Man in his 30s killed after car veers into stone wall on dual carriageway”. Feedback on “Man in his 30s killed after car veers into stone wall on dual carriageway”.